You may have heard about den animals, critters who have made burrowing and living inside a den a way of life. Don't be surprised to find Scruffy embarking on similar excavation projects in your yard. His habitat and burrowing goals though may be a tad bit different from those of moles, gophers and groundhogs. In the animal world, a den is basically a hole built by ground-dwelling animals. Its main purpose is to protect such animals from many hungry predators and the threats of extreme temperatures. 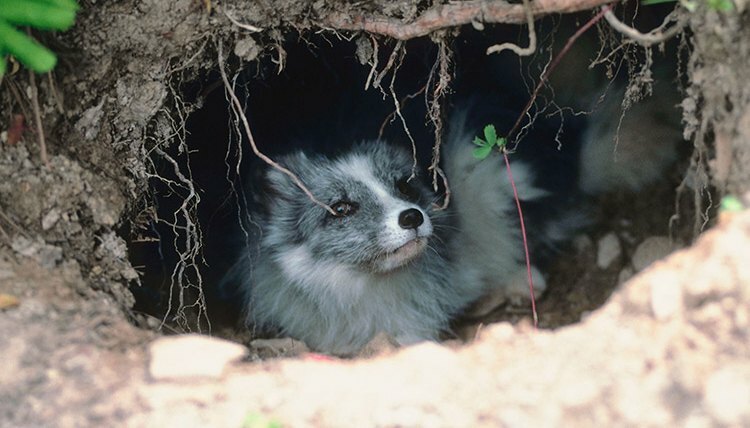 Such dens are often built in hollow trees or can consist of an underground burrow. Dens are for the most permanent homes, but in certain circumstances they may be used temporarily, such as wintertime dens or maternity dens. Meet Punxsutawney Phil Sowerby, the groundhog who keeps everyone waiting with bated breath on big Groundhog Day. Just as moles and gophers, groundhogs are animals who have decided to make a den their primary, permanent habitat. Dogs aren't den animals -- in the real sense of the word -- for the simple fact that they don't construct or use dens year-round as their primary, permanent residence. Yet, dogs seem to have denning instincts almost coded into their doggie DNA. In some cases, dens are simply temporary homes, such as the maternity dens used by wolves, coyotes and foxes. A mother may therefore decide to temporarily live in a den to give birth so to provide shelter and protection to her young when they're in a very vulnerable stage of their lives. Remnants of this instinct can often be seen in pregnant dogs when they start digging and shredding bedding and papers to create a nest. While dogs aren't considered den animals because they spend more than 95 percent of their lives outside in the open, consider though that their ancestors were once born and raised in maternal dens. rendezvous areas, which are ultimately the equivalent of open-air kindergartens. Of course it's obvious that Scruffy, your domesticated dog, has made your home his home, sweet home. In the wild, though, canines live in open habitats. Wolves, for instance, after feeding, seek out open areas to lie down and sleep. They may make their beds under coniferous trees, ridge tops or on rock outcroppings, which offer unobstructed views of their surroundings. During inclement weather, they may seek shelter by curling up in protected areas, such as under evergreen trees. This explains Scruffy's behavior of turning around and scratching his blankets before lying down. It goes back to the wild, when he stamped down grass, leaves or snow to create a soft, level surface to sleep on and scare unwanted critters away. You may have heard about dogs seeking out crates because they recreate the comfort and intimacy of a den. A crate isn't ultimately a home, nor a den, but more appropriately, it's simply a "place for confinement," suggests Steven R. Lindsay in his book "Handbook of Applied Dog Behavior and Training, Procedures and Protocols." While many dogs feel safe and content in their crates and young pups learn not to eliminate in them because they don't like to soil their "bedroom," some need a little extra help to get used to them. With some patience and positive associations, your dog can learn to love his crate. Pet MD: Dogs Aren't Den Animals...so Why do we Crate Them? Vetstreet: Why Does My Dog... Walk in a Circle Before Lying Down?